Tasty chewable approved to kill both fleas and ticks. It kills adult fleas before they lay eggs. Each chewable size is available in color-coded packages of 3 or 6 beef-flavored chewables. HUMAN WARNING: Not for use in humans. Keep this and all drugs out of the reach of children. In case of accidental ingestion, contact a physician immediately. MY dog chewed himself raw & bloody for 11 years. Flea meds, steroids, different shampoos, antihistamines, many vet visits & nothing worked. He has never "had fleas" but apparently, was allergic to the one flea in my yard. Romeo has lived comfortably for 2 years now that I have him on Nexguard. A great product!! Greatest Flea and Tick ever made!!!!!!! It does takes a little time for it to go into the blood stream, But once it does, everything changes.it works so well, I have never seen our dogs scratch or chew on their skin since. 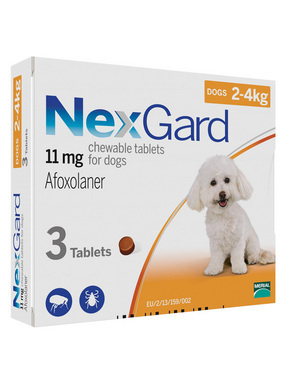 I highly recommend Nexgard!!!! You will not waste your money on this product. The medicine is by far the best one out there for flea and tick. Our dogs love the taste of it to I just wish the price was a little lower. Great company to do business with . Always courteous when talking with them .always eager to help with any problem. I have a kennel with 14 dogs and this is the only time we have ever been completely flea free. We are in the country and have problems with tick, no more, Nexgard took care of them. What amazes me is the fact that it also kills mange mites. We had a dog infected with the red mange and the vet prescribed one tablet followed up in 2 weeks with another and then monthly. It took 3 weeks and her hairs was growing back and no relapsing. This mange is passed from mother to babies when infected but, if she happens to accidentally breed, the mites are no longer there to be passed on. I still do not recommend breeding a dog that has had the red mange but it's good to know it's no longer a death sentence for the dog. Super great product. I received my order of Nexgard on Wednesday and Thursday I started to see dead ticks on the floor. examination of my dogs shows no more live ticks. That Nexgard really works fast. Thanks for the speedy delivery. My dog was diagnosed with red mange and the vet put her on Nexgard. One tablet to start, one more after two weeks, and then monthly. Within 45 days all her hair came back and the skin scrapping s were clear. I use it every month now. I have 15 Dobermans and my kennel is finally clear of fleas. I never knew that this product can make such a miracle. My dog appeared to have lots of fleas and ticks that made him too skinny and looks so sick these parasites are making his life so difficult where he can't enjoy playing anymore until we used Nexgard and we were surprised of it's immediate action that made us not just happy but our buddy as well. Thank you Pet Shed for the giving us the opportunity to experience great service and products from you. You were all simply amazing! I like seresto and advantage products but they didn't work this year; so I tried nexgard..I was amazed. Within 24 hrs fleas were gone. I will continue to use this. Price was reasonable. Excellent product. Works super for my chihuahua mix, and Alaskan Malamute. i so love nexgard. the dogs are very eager to have one.